Dining out at The Melting Pot is always a fun experience, but it can be quite pricey. Today’s secret recipe will show you how easy it is to make one of The Melting Pots signature fondues at home for a fraction of the price you would pay at the restaurant. This recipe calls for Butterkäse cheese which is a semi-soft cheese made from cow’s milk. It has a buttery flavor and can usually be found at any gourmet market. In case you can’t find Butterkäse, you can substitute Muenster or Gouda. Heat vegetable broth in the fondue pot. When hot add spinach, artichoke hearts, and garlic and mix well. Shred the cheese, then toss with flour. Combine the Butterkäse and Fontina cheeses and add a little at a time to spinach artichoke mixture. Stir until combined. Stir in Parmesan cheese and a dash of Tabasco sauce. Serve with bread or vegetables. 1) The #1 Worst Food For Weight Gain Revealed. It’s curious how the foods you think are ‘healthy’ are actually the ones that are making you fat. Get the best handbook on how to grow plants and vegetables indoors. Reduce Your Waistline In Just 28 Days! Today I have a secret recipe for a popular fondue recipe from The Melting Pot. Fondues are great for parties and always a nice touch for a romantic dinner. This recipe calls for Kirschwasser, which is a German clear brandy distilled from cherry juice and pits. If you can’t find Kirschwasser, then either omit or substitute your favorite brandy. Toss the cheese with the flour in a bowl. Place a metal bowl over a saucepan filled with two inches of water. You may also use a conventional double boiler. Bring the water to a boil over high heat. Reduce the heat to medium and pour the wine into the bowl. Stir in the lemon juice and garlic using a fork. Cook for 30 seconds stirring constantly. Add half of the cheese, and stir constantly until the cheese is melted. Add the remaining cheese a small amount at a time stirring constantly. Pour the liqueur slowly around the edge of the bowl. Pull the cheese mixture away from the edge of the bowl and cook for about one minute or until the alcohol cooks off. Stir the liqueur into the cheese. Stir the pepper in gently. 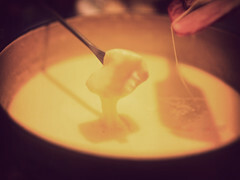 Pour into a warm fondue pot and keep warm over low heat. Garnish with a dash of nutmeg. 1) Amazing Cakes That Are Better & Cheaper Than The Bakery! 2) Learn How To Get Your House Sparkling Clean In Half The Time. 3) Fired Travel Agent Reveals How To Get Dirt Cheap Airfare! This angry ex-travel agent will reveal the deepest, darkest secrets of the airline industry to show how you can obtain tickets at ridiculously low costs! This nutty chocolate-caramel fondue goes well with fresh cut fruits, cheesecake squares, brownies, marshmallows. *If you do not have a fondue pot, you can prepare this recipe using a double boiler. **A candy thermometer will also come in handy with this recipe. In a fondue pot* slowly heat the chocolate and caramel to no higher than 135 degrees Fahrenheit**, stirring frequently. If the mixture seems too thick, slowly add whole milk until you reach the desired consistency. Slowly add rum to the fondue pot. Using a long match, carefully ignite the liquor by touching the flame to the edge of the pot. Do not lean over the pot while doing this. Once the flame burns out, add the nuts to the pot and stir. Serve fondue at a temperature of 120 degrees Fahrenheit with assorted dippers of choice. The Melting Pot is a great restaurant to go to with a group of friends or a special date. The bill can get pretty steep though… I like to create these dishes at home when I’m inviting guests over. More money in my pocket is always a good thing! This dip goes great with broccoli, cauliflower, carrots, celery, or zucchini. In a microwave-safe container, microwave cream cheese and milk for 2 to 4 minutes, whisking after each minute, until cream cheese melts and mixture is smooth. Stir in sour cream, onion, parsley and chives. Refrigerate until cold.